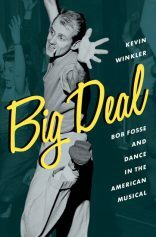 A fascinating look at the evolution of Fosse as choreographer and director, Big Deal: Bob Fosse and Dance in the American Musical considers Fosse’s career in the context of changes in the Broadway musical theater over four decades. It traces his early dance years and the importance of mentors George Abbott and Jerome Robbins on his work. It examines how each of the important women in his adult life – all dancers – impacted his career and influenced his dance aesthetic. Finally, the book investigates how his evolution as both artist and individual mirrored the social and political climate of his era and allowed him to comfortably ride a wave of cultural changes. Publication: Freeze! Challenge the Hierarchy: Researcher, Artist, User!